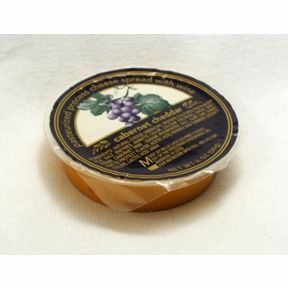 2 oz travel size Cabernet cheddar cheese spread in individual size wide-mouth plastic cup. A convenient travel size for on the go. Ingredients: natural cheese (american, gruyere [cultured pasteurized milk, salt, enzymes, annatto color, calcium chloride]), water, whey, cream, cabernet wine, sodium phosphates, salt, guar gum, sorbic acid to protect flavor, acetic acid, paprika and tumric extract (color), lactic acid.